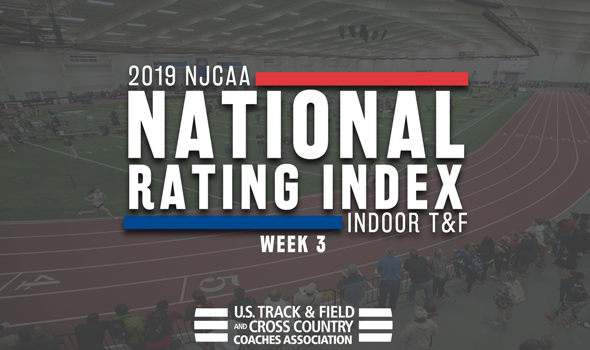 There is just under a month left in the indoor season, which means it’s time for the latest edition of the NJCAA National Indoor Track & Field Rating Index, released by the U.S. Track & Field and Cross Country Coaches Association (USTFCCCA) on Wednesday. Completing the top-10 was No. 6 Monroe (N.Y., 164.92 points), No. 7 Western Texas (145.20), No. 8 Colby (Kan.) CC (138.69), Vincennes (Ind., 97.92 points) and No. 10 Central Arizona (92.58). The group was led by top performers in Deborah Giffard (leads the country in the 60), T’Nia Riley (tops in the 200), Christal Mosley (second in the 400) and Cadeebra Calcote (fourth in the 800). Overall 15 performances made their way into this week’s updated index. Rounding out the rest of the top-10 was No. 6 Cowley (Kan., 170.30 points), No. 7 Central Arizona (154.23), No. 8 Iowa Western CC (152.14), No. 9 South Plains (Texas, 144.62) and No. 10 Western Texas (85.61).